Did you know Budapest is one of the most underrated cities in Europe? Budapest was always on my list of places to visit but I often ended up choosing another city that appeared "cooler" when it came down to actually planning vacations. However, my husband and I finally made Budapest happen last month! It was the last stop during our Europe trip, after Zurich, Vienna, and Bratislava. To be honest, I realized I didn't know much about Budapest (which by the way, is pronounced "Boo-da-PESHT,") until the trip. First off, it's apparently a very popular destination for bachelor/bachelorette parties! All thanks to the numerous cool pubs and stylish clubs, which my husband and I didn't get to check out. But hey, if you're looking to plan one for someone, maybe you can consider Budapest! Something else I learned when I was in Budapest was how difficult the Hungarian language is! I used to imagine it would be similar to German, but people told us that the most similar language is probably Finnish. 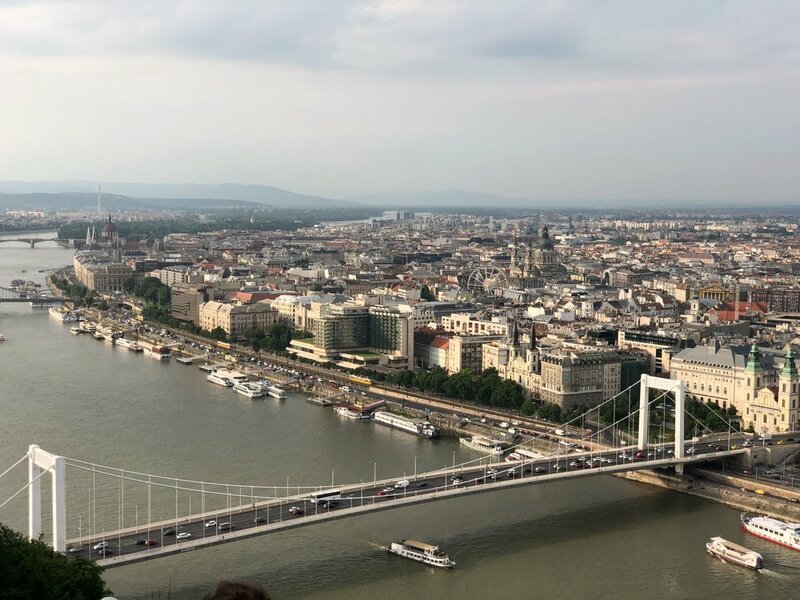 So anyway, there were so many great things about Budapest that I adored, including the food, friendly people, my Airbnb (yes, seriously), and the museums, but one thing I found to be the most memorable was the panoramic city views! And there are so, so many great spots that offers them, too. My number 1, favorite location in Budapest is Fisherman's Bastion. A lot of people, including myself, thought it was a castle. I swear it looks like somewhere you'd find Sleeping Beauty! But actually, it is simply a very pretty city-viewing terrace built in the late 19th century. From here you have a clear, unobstructed view of the Gothic-revival style Hungarian Parliament Building. Dress by Sachin & Babi (similar here and here). This set of photos at Fisherman's Bastion was taken by Dana J. Ardell; you can check out more shots from this collection on her blog. The Citadella (the Hungarian word for a type of fortress), located on the top of Gellért Hill, is a symbol of the city. It was built after the suppression of the Hungarian Revolution, and from here, you have a beautiful panoramic view of the city. My husband and I went up the hill the first night we arrived in Budapest. We knew it was up on a hill but somehow didn't expect a hike. It wasn't too difficult but we both got to the top with red flushed faces (okay, probably because we were both out of shape, too). So anyway, be prepared for it and be sure to wear comfortable shoes! A shot of the city taken from the Citadella at around 6:30pm. There is a bit of a hike up to the Citadella, but it's totally worth it! I think almost all of the castles I've ever visited before come with fabulous views! It was really fun walking around the vicinity of the castle but we spent a lot of time just enjoying the scenery, too. From here, you can see Chain Bridge, the first permanent bridge that crosses the Danube in Hungary, connecting Buda and Pest. You can also get a really wonderful city view onboard the Castle Hill Funicular. Named in honor of the first King of Hungary, Stephen, this Roman Catholic basilica is supposedly where you will find King Stephen's right hand stored in the reliquary. The towers and the dome stand tall in the flatland of the Pest side of Budapest, making it another good spot to enjoy the view of the city. Out of the 5 spots, however, this is the only one that requires an entrance fee, as you need to pay to get up to the very top. And keep in mind: there isn't a lot of space for walking, and it can get really crowded on weekends! Walking along the east bank of the river gives you a great view of the hilly Buda side of Budapest. I especially enjoyed the section where you can find statues of shoes on the Danube Bank because I was able to learn more about the history. The shoes are a memorial to honor the people killed by fascist Arrow Cross militiamen during World War II. Those who were killed were ordered to take off their shoes before they were shot at the edge of the water so that their bodies would fall into the water and be washed away. The sculptures are a representation of their shoes left behind on the bank. You'll find a lot of people sitting by the river around this area, taking in the view, and simply soaking in the surrounding. I felt like it was a really peaceful spot. 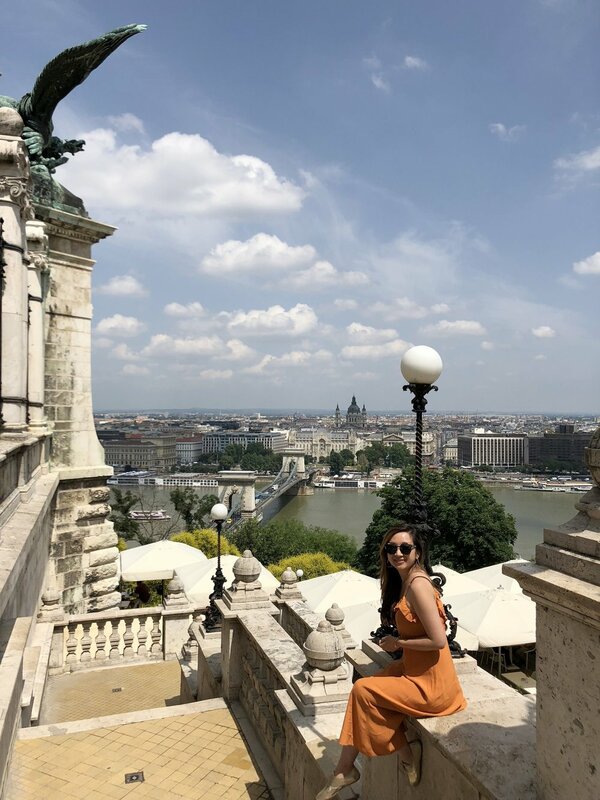 Let me know if you have a favorite spot to enjoy the city view in Budapest by leaving a comment below! You can find people leaving candles, hand-written notes and other personal items here. Tricia takes you to five photogenic places in Boston! Find out why I like the Reichstag Dome so much! Highlights and what I missed from my Vienna trip!